I am fascinated by creativity and am always happy to read anything that might give me better understanding about what is happening in the minds of those people I spend a lot of time with – namely highly creative people working in all sorts of disciplines (not just the obvious ‘creative’ arts jobs). I enjoyed this book because not only does it helpfully break down creativity into 10 traits (and thus makes reading it in short bursts at bedtime that much easier) but it is also based on current research in neuroscience and psychology. Because, who doesn’t love pages of notes to follow up with? (Ok, maybe not everyone, but it gives me a nice sense of being in good hands). This month’s book recommendation is something that has been on my radar for years and I’ve always had a ‘yeah, yeah, Rilke’s Letters to a Young Poet – that’s got all sorts of insights into being an artist. I know I should read it, but…’ attitude towards it. Which, of course, was stupid. And I (wrongly) assumed it was quite long. So when it was recommended, again, by a newsletter I love and trust completely I was compelled (in the spirit of doing stuff now and not putting it off) to go out and buy a copy. And blow me if it isn’t a tiny wee slip of a book (52 pages) and this edition cost a whopping £1. That’s right, people, £1. There are NO MORE EXCUSES for you not to read this! Now, this isn’t a life-changing book, because what writing can live up to the hype? But it is full of interesting ideas on living a creative life, and insights into the mind of a formidable creative force, and that’s really all I need on a grey autumn day when I don’t have a lot of energy to be focused and concentrate. Ok, so I know it's not fair to expect much from a book which is, generously put, slim. But when the quote on the cover says "an intriguing meditation on how vital our hands are to our understanding of ourselves and our world" well, am I not allowed to think this is going to be awesome? Spoiler - this book isn't really that great. And so, I'm not calling this my 'recommended book of the month'. It's merely a starting point for a bit of a digression on the power of books to promise so much and deliver so little, and how I am always willing to take a chance that the next one will be just what I hope it will be. This month’s book recommendation may look like a personal development book from its title. I must admit that that's why I picked it up at first, thinking that maybe it contains the secrets to finding your passion in life (and thus will change everything). I'm sorry to say that this book may not actually help you find your passion in life, but it does show us how creating the right educational environment, and honouring the role creativity plays within society, will lead to everyone having the possibility of discovering their passion. Which is something I feel strongly about. This month’s book recommendation comes with a caveat. Not because it isn’t very good (it really is) but because I feel a bit awkward recommending a book which is aimed so squarely at only half the population. My aim with highlighting books on my blog is to share what I’ve been reading and the things I’ve found enjoyable, provoking and inspiring with the hope you might find them similarly helpful. This book is one of the few ‘personal development’ books I’ve read when I felt like it was written about me, and about people I know. So I couldn’t not tell you about it, despite its narrow focus. I hope you’ll forgive me this once, and I hope you’ll consider reading it no matter how you gender-identify; there are good insights for all in it. One of my favourite quotes (that I have stuck on my computer) is by Marcel Proust: "The real voyage of discovery consists not in seeking new landscapes, but in having new eyes." It's a sentiment that I wholeheartedly believe and which transforms the quotidian into the extraordinary without much effort at all. This book embodies this quote. 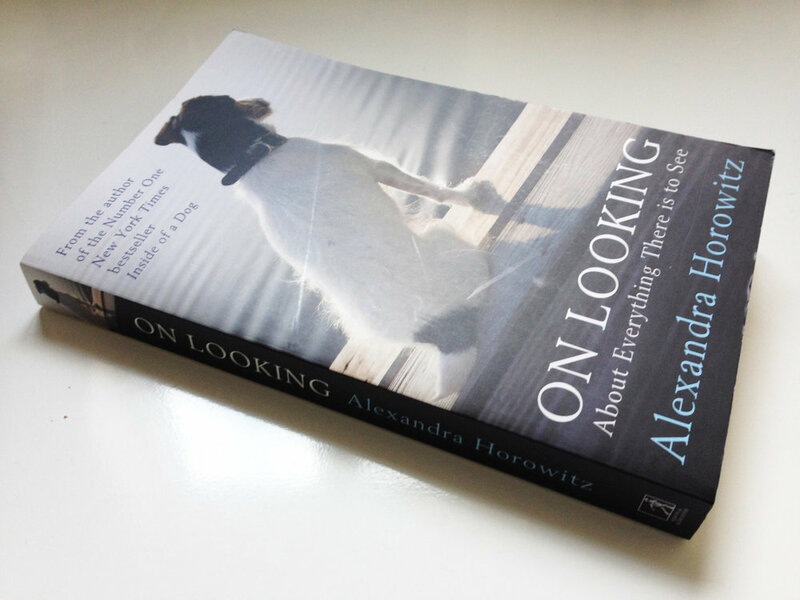 In On Looking: about everything there is to see, author Alexandra Horowitz asks us to take a walk with her. (Well, to take twelve, actually). Her premise is that we are terrifically bad at noticing stuff. Every day we "miss the possibility of being surprised by what is hidden in plain sight right in front of us" because we are too distracted by our modern lives. We have lost the skills of attention and focus, we walk in a daydream, on autopilot going about our business. She advocates a more mindful approach, aiming to bring active attention to our daily lives by noticing new things. And these new things aren't somewhere different and exciting, they are on your doorstep. I am in search of a philosophy for life. Are you? I read a lot of books about ways to live, how to be happy, understanding purpose and none of them feels like they give me all the answers. But, the Stoic philosophy, with its focus on being active and practical in your approach gets the closest for me. I, like the Stoic philosophers, believe that the only thing in the world that I have any influence over is my own mind, and as such my energy shouldn't be put towards worrying about things I can't control, but learning how to reframe and work with the things life brings my way. Nothing earth-shatteringly surprising there. But seeing some of these aspects of myself, which I probably wouldn’t have put right at the top, has helped me to realise what it is that I do well and how I want to work in the future. My top 5 has become a bit of a guiding light while I plan and reflect. So, I know you’ll understand why I recommend this book to you this month - Curious by Ian Leslie.